Immigration law — Refugee protection — Persecution — What constitutes persecution — Miscellaneous issues — Practice and judicial review — Judicial review — Grounds for — Application by the Kalejas to set aside the Board’s decision refusing their refugee status claim allowed — The Kalejas were Czech citizens of Roma ethnicity — The Kalejas submitted that the Board erred by finding that they were not at risk of persecution and by failing to comprehensively review country conditions — The Board’s decision did not meet the requirement of justification, transparency and intelligibility as it did not sufficiently distinguish persecution from what the Kalejas experienced — Furthermore, the Board did not adequately address the evidence regarding country conditions — Therefore, the Board made a reviewable error. Kevin Doyle, for the Respondent. O’KEEFE J.:– This is a judicial review of a Refugee Protection Division (the Board) decision dated February 9, 2009 refusing the applicants’ refugee status claim pursuant to section 96 and subsection 97(1) of the Immigration and Refugee Protection Act, S.C. 2001, c. 27 (the Act). The applicants, Miroslav Kaleja (the principal applicant), and his daughter, Greta Kalejova (the minor applicant) are Czech citizens of Roma ethnicity. The principal applicant’s two sons did not appear at the Board hearing and are not parties to this judicial review application. The applicants request that the Board’s decision be set aside and the matter be referred to a different officer for redetermination. As a child, the principal applicant was placed in a school for children with special needs, where Roma students were usually sent. Before entering the classroom, the teacher would always come outside and check his head and hands for dirt and lice before allowing him in the classroom. Allegedly, this was only done to the Roma children. When he finished his education, the principal applicant went into the army and he claims he did not have the same privileges there as the other soldiers. He was never allowed to rest between work assignments unlike the others. The principal applicant married his first wife at an early age and they had three children. Due to his unemployment and financial problems, they had to live with his wife’s parents. He then started to work as a musician in a hotel in Prague. He claims the housing and financial problems were the main reason for his divorce in 1993. In 1994, the principal applicant alleges being attacked by skinheads when he was on his way home from work. He suffered stitches on his left leg from a baseball bat and injuries to his back and shoulders. He also had a broken finger and lost some teeth in the attack. Police officers driving by called an ambulance for him, but they advised him not to say that skinheads had attacked him. A police report was written to say that unknown perpetrators were responsible for the attack. The principal applicant also stated that he was subjected to racial insults over many years. 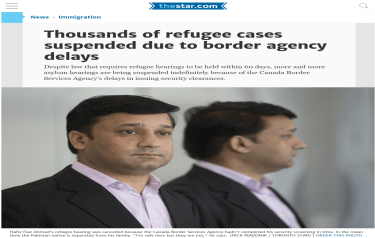 The principal applicant arrived in Canada in January 16, 2008 and claimed refugee protection on February 5, 2008. Greta Kalejova, according to her father’s allegations, has been bullied at school because of her ethnicity, but when the principal applicant and his wife complained, the principal told them to be glad their daughter was attending the school and nothing was done. The applicants submit that they were deprived of legal aid under questionable circumstances and that this justifies a judicial review. Former counsel from the Legal Aid office provided an opinion to the effect that the applicants have an excellent chance of succeeding before the Board. However, they were thereafter refused further coverage. The applicants were not in a financial position to retain counsel privately. Proceeding without legal counsel was very detrimental to their case. The Board misunderstood their situation, stating that “they confirmed that they previously had counsel and they had dismissed that person”. On the merits of their case, the applicants submit that the Board erred by finding the applicants were not at risk of persecution. The Board made a clear error by not considering that the attack the principal applicant experienced in 1994 did not constitute persecution. The Board also erred in blaming the principal applicant for not following up on the matter with the police. In fact, the police would not do anything because he was only able to give a generic description of the assailants. The Board further erred by entirely ignoring the evidence regarding the rise of neo-Nazis in the Czech Republic. Finally, in the daughter’s case, the Board did not apply the test for cumulative persecution reasonably where there was sustained and systemic violation of basic human rights. The applicants also submit that the Board erred in failing to comprehensively review country conditions. Once the Board is satisfied that the applicants belong to the claimed ethnic group, the Board, even if it disbelieves the alleged incidents of persecution, still has a duty to review the country conditions materials. Here, the Board only focused on the incidents of discrimination and found them not serious enough. However, the applicants could still have a well-founded fear of persecution simply because they are in an environment hostile to Roma persons. The respondent submits that the Legal Aid decision was not an error of the Board. The Board bears no responsibility for the reasonableness of any decision of Legal Aid. In immigration matters, the right to counsel is not absolute. As long as a refugee claimant is afforded a fair hearing, the Court should not intervene. In this case, the Board took more than adequate steps to ensure that the applicants received a fair hearing and was clearly aware and attentive to the fact that the applicants were unrepresented. The respondent submits that the finding that the alleged acts of discrimination did not amount to persecution was reasonable. The Board considered the 1994 attack and found that the seriousness of the incident was mitigated by the length of time that had passed since then, as well as the fact that the principal applicant did not follow up on his report to the police. These are reasonable findings. The Board reasonably considered the cumulative effect of the incidents. The Board did not err in finding that the basic human rights of the applicants had not been affected in a fundamental way. The respondent finally submits that the Board adequately assessed the country conditions. The Board properly reviewed the country conditions documents. The member acknowledged that the documents indicated that Roma in the Czech Republic face societal discrimination. However, the Board, after considering the documentary evidence and the testimony, concluded the various acts of discrimination faced by the applicants did not amount to persecution. This conclusion is within a range of reasonable outcomes. What is the applicable standard of review? Is the Board’s decision reviewable because the applicants were unrepresented by Legal Aid? Was the Board’s conclusion that the applicants did not have a well-founded fear of persecution reasonable? If the decision is reviewable because of the lack of representation, the only potential error imputable to the Board would be a breach of procedural fairness in proceeding with the hearing although the applicants were unrepresented. The standard would therefore be correctness (seeAustria v. Canada (Minister of Citizenship and Immigration), 2006 FC 423,  F.C.J. No. 597 at paragraph 3). The applicants’ argument about the treatment of the evidence on country conditions can be viewed as a question of sufficiency of reasons and therefore a matter of procedural fairness (see Junusmin v. Canada (Minister of Citizenship and Immigration) 2009 FC 673,  F.C.J. No. 844 at paragraph 23). However, the applicants did not address this issue from a sufficiency of reasons perspective, they alleged the Board disregarded the evidence on country conditions. If this issue is to be viewed in this perspective, it is a matter of the assessment of evidence by the Board and it is a question of fact. In Dunsmuir v. New Brunswick, 2008 SCC 9,  1 S.C.R. 190,  S.C.J. No. 9, the Supreme Court held that questions of fact are usually reviewable under the reasonableness standard. It is true also that the identification of persecution behind incidents of discrimination or harassment is not purely a question of fact but a mixed question of law and fact, legal concepts being involved. It remains, however, that, in all cases, it is for the Board to draw the conclusion in a particular factual context by proceeding with a careful analysis of the evidence adduced and a proper balancing of the various elements contained therein, and the intervention of this Court is not warranted unless the conclusion reached appears to be capricious or unreasonable. I wish to deal first with Issue 3. I acknowledge the documentary evidence which states, “Random violence, rallies and vandalism by neo-Nazis and skinheads groups against Roma occurred throughout the year. Societal discrimination against minorities, especially in Roma, continued and a lack of an equitable education, housing and employment opportunities for Roma persisted.” “the laws prohibit discrimination based on race, gender, disability, language or social status; however significant societal discrimination against Roma and women persisted.” However, the examples of discrimination given by the claimants in this case do not indicate that they have been subjected to this level of persecution. This does not respect the requirement of an “existence of justification, transparency and intelligibility within the decision-making process” (see Dunsmuir above at paragraph 47). Where, as here, documentary evidence of the kind in issue here is received in evidence at a hearing which could conceivably affect the Board’s appreciation of an Appellant’s claim to be a Convention refugee, it seems to us that the Board is required to go beyond a bare acknowledgment of its having been received and to indicate, in its reasons, the impact, if any, that such evidence had upon the Applicant’s claim. As I have already said, the Board failed to do so in this case. This, in our view was a fatal omission, as a result of which the decision cannot stand. The Board member is presumed to have considered all the evidence without the need to address every piece of evidence. Nevertheless, the Board member has a duty to address in his reasons any evidence directly contradicting conclusions on a key aspect of a determination. The Board denied the applicants’ claims because it did not find them credible. However, I am of the view that, in the circumstances of this case, there was before the Board independent and credible documentary evidence that was not considered. The Board should have expressly assessed this evidence in its reasons and by failing to do so, I am left to conclude that it made its decision without regard to the material before it. I deem this evidence sufficiently important and material to the claim that, had it been considered, it could have been capable of supporting a positive determination of the refugee claim. As a result of my findings, I am of the view that the Board made a reviewable error. The decision of the Board must be set aside and the matter referred to a differently constituted panel of the Board for redetermination. Because of my finding on Issue 3, I need not deal with the other issue. IT IS ORDERED that the application for judicial review is allowed and the matter is referred to a different officer for redetermination. The relevant statutory provisions are set out in this section. A person in Canada who is a member of a class of persons prescribed by the regulations as being in need of protection is also a person in need of protection. soit, si elle n’a pas de nationalité et se trouve hors du pays dans lequel elle avait sa résidence habituelle, ne peut ni, du fait de cette crainte, ne veut y retourner. la menace ou le risque ne résulte pas de l’incapacité du pays de fournir des soins médicaux ou de santé adéquats. A également qualité de personne à protéger la personne qui se trouve au Canada et fait partie d’une catégorie de personnes auxquelles est reconnu par règlement le besoin de protection.